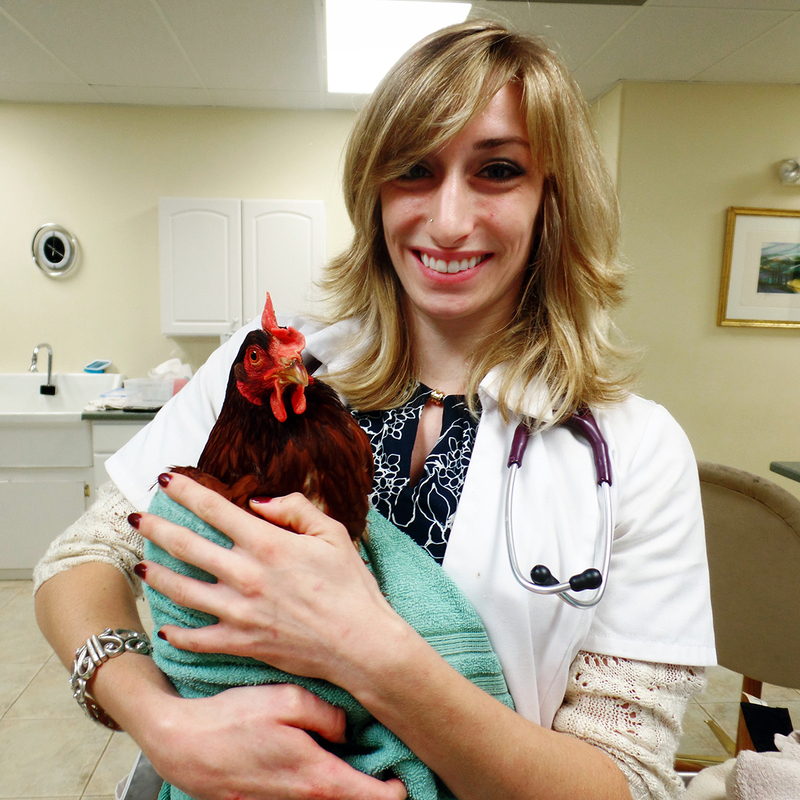 Henrietta is a young Rhode Island Red hen that presented to our clinic after she had been attacked by a fox. We always take animal attack cases very seriously, especially when it involves a mammal attacking a bird, as birds are especially sensitive to the dangerous bacteria that lives in mammalian saliva. 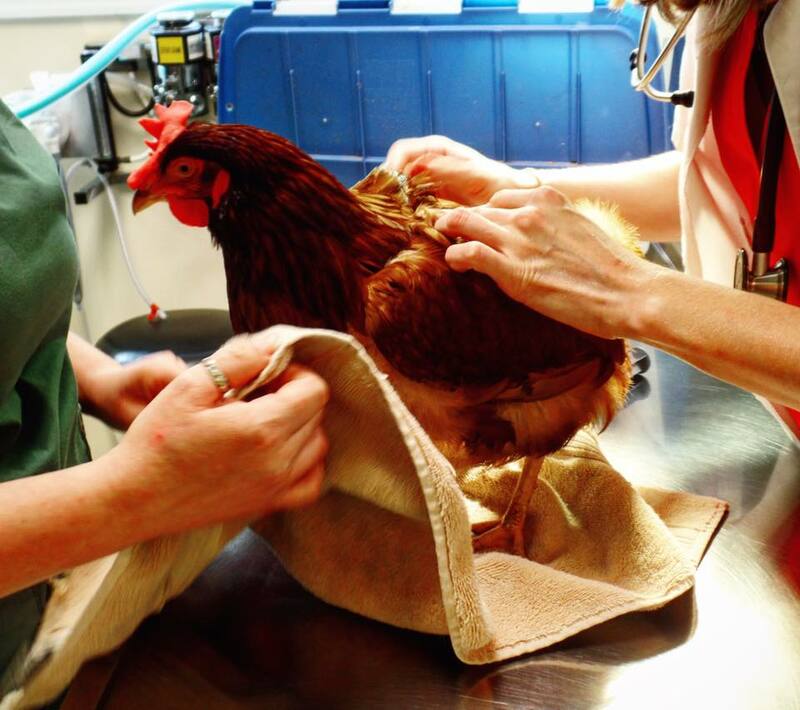 When Henrietta arrived, we quickly admitted her and performed a full physical exam. 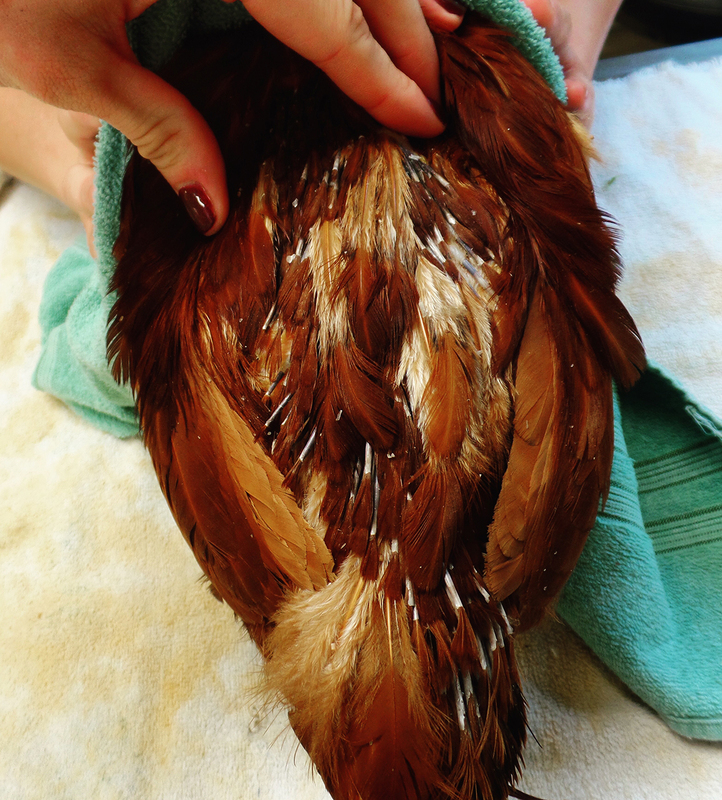 Another difficult aspect of avian medicine is that birds tend to hide their illness, as they are prey animals, so even if a bird seems to be doing okay, they are usually more sick than they are letting on. Henrietta was alert and responsive, but certainly more quiet than we would expect a chicken to be. Dr. Rebecca Gounaris looked Henrietta over thoroughly to assess what wounds she had suffered, and if any other body systems had been compromised. Luckily, after a thorough exam, all of Henrietta's wounds were found to be superficial. 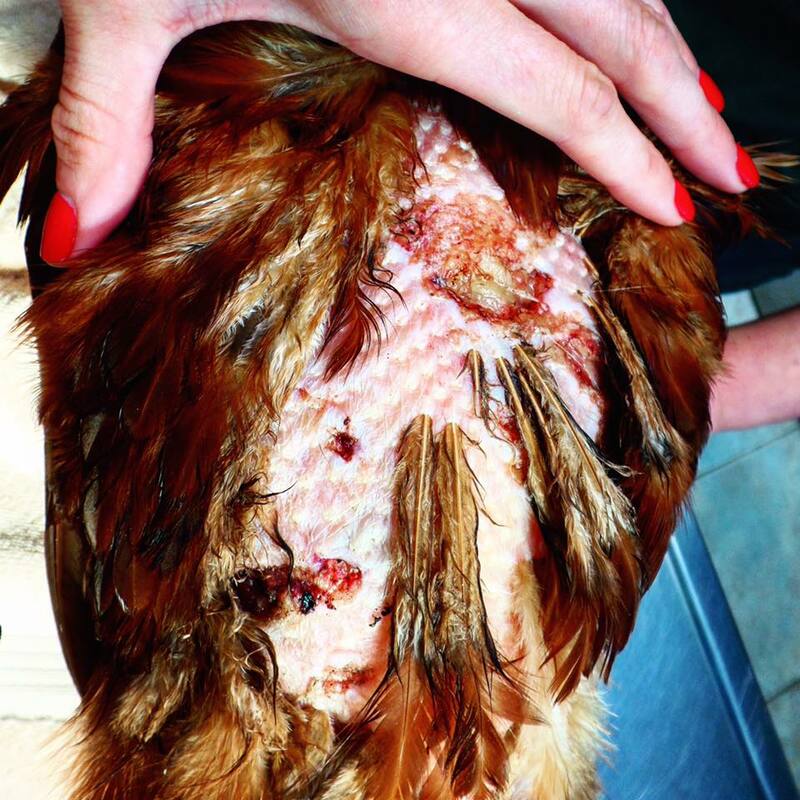 However, she had still lost several patches of feathers, and the wounds that were present were bad enough that they needed to be sutured closed. We flushed out the wounds generously and closed up the wounds. With Henerietta's wounds tended to, the other aspect of therapy included antibiotic therapy as well as anti-inflammatories for the pain. We always use antibiotics in animal attack cases, because as mentioned before, mammals carry dangerous bacteria in their saliva, and if not treated, any bite would could potentially develop into septicemia, a life-threatening blood infection, in a bird. Henrietta was sent home that day, but the owners were instructed to keep her separated from other chickens, and to continue the antibiotics and anti-inflammatories. Chickens are notoriously for developing a "pecking order," and when one chicken is injured, they are more likely to pick on that chicken, so it is important to keep these birds separated when they are recovering. 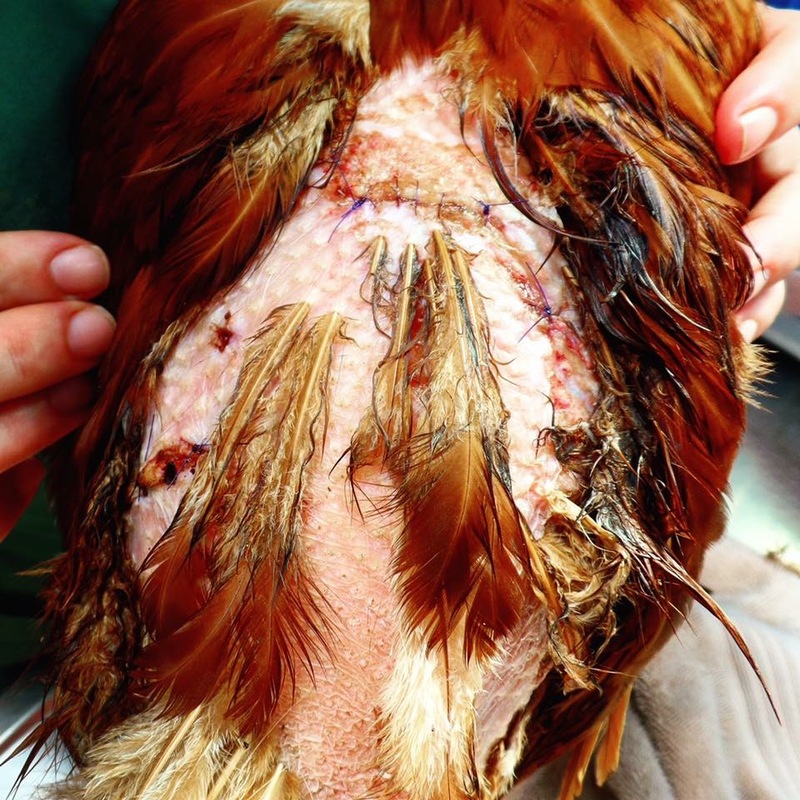 Since the owners also used Henrietta's eggs for food, they were instructed to discard any of Henrietta's eggs for at least 2 weeks after antibiotics to prevent residue. When Henrietta returned for her suture removal in 2 weeks, we were amazed to see just how well she was doing! She was already growing back her feathers at an amazing rate, so much that it was difficult to find the stitches to remove. She was also much more spunky at her recheck appointment. 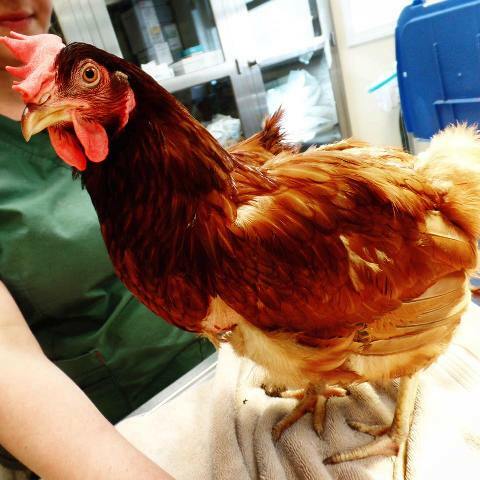 We are very happy to report that Henrietta is since doing very well, and goes to show that with good antibiotic therapy and nursing care, these chickens can quickly bounce back! They are certainly tough little animals!